Hi. Thanks for stopping by. 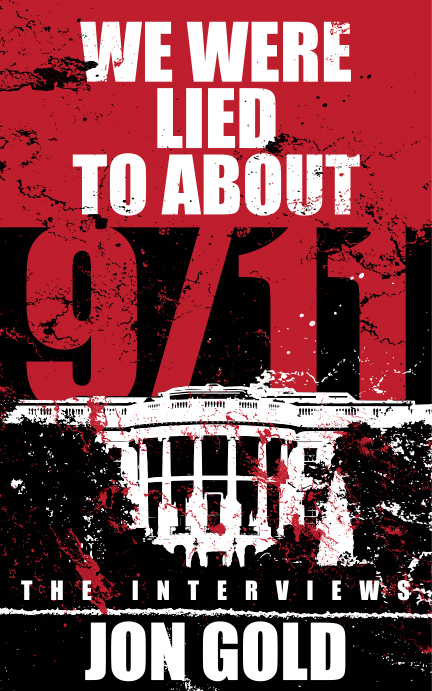 Here, you can get a free copy of my new book “We Were Lied To About 9/11: The Interviews.” For a time, I had a show that focused on the lies of 9/11. I can almost guarantee that a lot of it you’ve never even heard of. I did my very best to get the “best of the best” to interview. I did so much research for each interview so as to be able to ask the right questions. I and a number of my colleagues feel that much of this information has been suppressed or not widely circulated, leaving a large gap in what the general public knows about much of what occurred before and after 9/11. My hope is that this book will encourage more people to ask questions, do their own research, and share what you learn. During the show, a lot of people asked me for transcripts of this or that show. It took A LOT of work, but here are those transcripts. Hopefully, you remember the time right after 9/11. A time when we were told repeatedly that there were absolutely no warnings, and that no one had any idea something like that could happen. If not, feel free to browse the "9/11 Denials" section available at www.historycommons.org. The debate over a planned Islamic community center several blocks from New York City's World Trade Center site is a "distraction," according to Rep. Alan Grayson (D-FL). Instead, the debate should shift in focus to an examination of the administration which "let it happen." 'It,' of course, being the attacks of Sept. 11, 2001. The remark was made during a Friday appearance on MSNBC's The Ed Show with former liberal talk radio host Ed Schultz. “If we are going to talk about 9/11, why don’t we talk about how not so much the people who died on 9/11 were disgraced by the possibility of an Islamic athletic center several blocks away; how about the fact that they were disgraced by a president who let it happen?" he asked. "Who went on vacation for the entire month of August after he was warned in writing that Osama bin Laden was actually finding targets in NYC and learning how to take these planes and do terrible things with them? The thing itself said ‘hijacking’ and they did nothing about it." We have found the famous "What Do I Do Now?" memo drafted by 9/11 Commission Executive Director Philip Zelikow on March 2, 2003. The memo advised staffers newly hired by the commission what they should do after starting work. The memo was found by Erik at the National Archives and uploaded to the 9/11 Document Archive at Scribd. Interactions with commissioners can be helpful to you and them. If you are contacted by a commissioner with questions, please contact Chris [Kojm, Zelikow's deputy] or me. Consulting with the Chair and Vice-Chair, we will be sure that the appropriate members of the Commission staff are responsive. Documents recently found in the National Archives cast doubt on the integrity of the 9/11 Commission’s Executive Director Philip Zelikow. In an e-mail exchange with author Philip Shenon, Zelikow claimed that he first learned of a dispute on the commission over the investigation of false statements made by NORAD and FAA officials after it had been “percolating for a while” and was not involved in the initial stages of the argument. However, an e-mail chain (scroll down) found in the Archives by History Commons contributor paxvector shows that Zelikow had been involved in the issue from very near the beginning. Zelikow made the claim he was not involved in the initial stages of the dispute in response to an allegation made by commission staffer John Azzarello and relayed by Shenon. After the staff investigators drafted a memo for the commissioners in early April 2004 outlining why they thought NORAD and FAA officials had deliberately lied to them to overstate the military’s readiness during the attacks, Zelikow “just buried that memo,” according to Azzarello. In response, Zelikow claimed that he had not even known of the issue at the start. The implication was that, as he had not known of it, it could not be him that was orchestrating--or even involved in--a dispute between the staff investigators and the commission’s lawyers, Daniel Marcus and Steve Dunne. However, the newly found e-mail chain shows Zelikow did know of the issue in April, raising the question as to why he falsely told Shenon he did not. Zelikow is not known to be linked to the FAA, but, if the commission had referred the matter to the Justice Department and it had started a perjury investigation against NORAD officials, this would certainly have had the potential to embarrass his friends at the Pentagon. Zelikow is alleged to have husbanded the issue to ensure a less potentially embarrassing referral to the inspectors general of the FAA and Defense Department, who in the end blamed the false statements on innocent mistakes and poor logkeeping. A document recently discovered in the National Archives shows that, in a memo to the 9/11 Commission’s chairman and vice-chairman on false statements made by NORAD and FAA officials about the failure of US air defenses, the commission’s Executive Director Philip Zelikow failed to mention the possibility of a criminal referral. This supports allegations that Zelikow “buried” the option of a criminal referral by the commission to the Justice Department for a perjury investigation. The document was found at the National Archives by HistoryCommons contributor paxvector and posted to the History Commons site at Scribd. Phil, you and I have corresponded on several occasions, and I have found you to be a relatively nice guy. For those who don't know, Phil Shenon covered the 9/11 Commission for the New York Times. He recently released a book entitled, "The Commission: The Uncensored History of the 9/11 Investigation" that cites many of the problems with the 9/11 Commission. He also runs a blog available here. Recently, you wrote an article regarding the 9/11 Commission's reliance on testimony gotten through torture, and I commend you for that. Several times in my correspondence with you, I have asked why hasn't the New York Times run a front page story on the problems with the official account and each time, I haven't gotten an answer. WeAreChangeLA schools Philip Shenon on Michael Scheuer, Mossad and the meaning of evidence when it comes to "incompetence"
At what point does "criminal negligence" become so extreme that it can be considered "complicity" beyond a reasonable doubt? Shenon attempts to put the "incompetence", "ignorance", "failure to imagine", "system failure" and "covering up incompetence" spin on what he reports while essentially supporting the theory that Al Qaeda outwitted the dimwitted and incompetent US intelligence and defense establishments, but even what he does say seems like grounds for impeachment hearings to me. "The warnings were going straight to President Bush each morning in his briefings by the CIA director, George Tenet, and in the presidential daily briefings. It would later be revealed by the 9/11 commission into the September 11 attacks that more than 40 presidential briefings presented to Bush from January 2001 through to September 10, 2001, included references to bin Laden. The Bush story about 9/11 takes a hit from their ally the Washington Times- exposure of Saudi involvement in 9/11 is exposure of Bush family/administration involvement in 9/11. By Frank J. Gaffney Jr. The United States is in mortal period from a false friend: the Kingdom of Saudi Arabia. The peril emanates from the totalitarian legal-religious-military-political code the Saudis call Shariah and their assiduous efforts to impose it worldwide. The danger is enormously exacerbated by the almost-complete failure of American officials at every level of government to acknowledge, let alone act to prevent, the Saudis' true agenda. Philip Shenon was on a panel at the LA Times Book Fair about a month ago titled "Checks and Balances." I decided to ask him about taking 9-11 truth into the courtroom. He dodged the question a bit, but definitely did not poo-poo the 9-11 truth movement or the millions of Americans who don't believe the official conspiracy theory. This video has a little of the middle-section when I was interrupted edited out. A fuller, unedited version might be forthcoming. After this, Shenon ended up coming out to the 9-11 truth information table to speak with us. He was a very gracious man, but appeared to dodge some questions. See what you think from these videos. Higher quality (audio/video) recordings are becoming available as we speak. I've transcribed some of the pages having to do with Cheney from Phil Shenon's book, "The Commission". The back cover says, "How Vice President Cheney tried to pressure the Commission to change its assessment of his actions on 9/11, and how he may have tried to cover up his role." Daschle would be out of his job as majority leader in January, when the new Republicans would be sworn in. The GOP already controlled the House. Daschle figured that with Republicans in full control on Capitol Hill, Congress would be out of the business of oversight, especially when it came to September 11 and the performance of the Bush White House in dealing with the threat of al-Qaeda before and after the attacks. It had become clearer and clearer to Daschle and other Democrats--and to the Washington press corps and even some Republicans--that the White House was hiding something, perhaps many things, about what Bush knew about al-Qaeda threats before 9/11. The New York Times review (2/4/08) of Philip Shenon's book, The Commission, referred to Philip Zelikow as the Black Hat of the story. This book contains a wealth of detail on behind-the-scenes relationships and processes within the 9/11 Commission. In my opinion, the writing will be best savored, evaluated, and utilized within the 9/11 truth community. To underestimate it or refuse to read it because of some basic faults would deprive one so deciding a generous experience in their search for truth. James Moore, co-author of "Bush's Brain" and "The Architect," has no doubt "that Karl [Rove] was running the 9-11 Commission"
Last Sunday, on "Live from the Left Coast" on KPFK in Los Angeles, Ian Masters had on James Moore the co-author of "Bush's Brain: How Karl Rove Made George W. Bush Presidential" and, more recently, "The Architect: Karl Rove and the Dream of Absolute Power." The show recording is here: http://www.ianmasters.org/left_coast.html -under March 30th, 2008- My question is at the 41:10 mark. Me: "...I think that this is a very crucial sort-of connection for Karl Rove, because that Commission was highly manipulated and, if it was manipulated and it was a cover-up, then, under Article III Section 3 of the Constitution, I think we can consider it a treasonous cover-up." "Senior investigators on the 9/11 Commission believed their work was being manipulated by the executive director to minimize criticism of the Bush Administration." "There’s a lot of things they missed, and unfortunately there is going to be a lot of talk for rest of our lifetimes about whether or not these connections at the White House had some impact on the final report." -- Philip Shenon on "The Daily Show, with Jon Stewart, February 10, 2008I first met Philip Zelikow, the Executive Director of the 9/11 Commission, during the "independent" investigative body’s first hearing in New York City in 2003. As Executive Director, Zelikow was to set the course of the investigation and I was curious to hear what Zelikow had to say. After the hearing, gathered in a tight little circle of journalists, Zelikow mused on two monumental and historic investigations, the Warren Commission – created to investigate the assassination of President John F. Kennedy, and his Commission – created to investigate the mass murder of over three thousand people from over 80 countries. Before cutting himself off and expressing concern about going "on-the-record", Zelikow insisted he would avoid the fate of the Warren Commission, which many critics have questioned over the years, and announced that Lee Oswald acted alone.